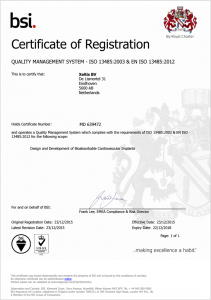 Xeltis has received ISO certification for its Quality Management System, which complies with the requirements of ISO 13485:2003 and EN ISO 13485:2012 for the design and development of bioabsorbable cardiovascular implants. The certification by Royal Charter provides further guarantee about Xeltis’ quality management capabilities and commitment to deliver consistent quality for international regulators and future customers. “ISO certification is another step forward for Xeltis on the roadmap to market for our bioabsorbable cardiovascular products” commented CEO Laurent Grandidier.